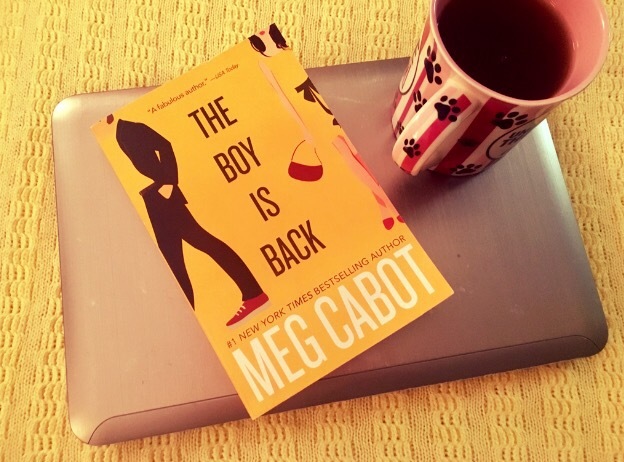 Needless to say, when her latest, The Boy is Back, was released, I immediately bought it, I immediately cleared my to-do list, and I immediately dove into the delicious, fun and funny world Meg Cabot has created. Told through emails, text messages, journal entries and group chats, The Boy is Back tells the story of a pair of former high school sweethearts and their rocky road to reconnecting. Ten years out of high school, Becky Flowers is a successful business owner in her hometown of Bloomville, Indiana. By day, she helps her aging clients with the transition of downsizing from their homes to retirement communities, smaller living spaces, and the like. By night, she is hanging out with her plaid-loving, wine and cheese shop-owning boyfriend. She is definitely not thinking of Reed Stewart, the boy she gave her heart to in high school, who she hasn’t spoken to or seen in a decade since their unfinished goodbye—even if he is now a world-famous professional golfer with his face splashed all over her TV. But when Reed’s parents try to pay for their dinner with a postage stamp (yikes), sending the family’s name through the news, sending Reed’s siblings into a panic, and sending Reed back to Bloomville for the first time in over ten years, Becky can’t seem to avoid him—especially when his family hires her to help out with their parents. As Becky and Reed find a way back to each other—er, find a way to work together—they must also both work to confront the past, reconcile their mistakes, and figure out what the future has in store not only for themselves, but for their families. It’s a ride that is at once hilarious, heartwarming, and full of hope, and before I knew it, I had breezed right through the book I had just picked up. The Boy is Back isn’t simply a story of two former flames reconnecting; it’s a story of family and forgiveness, and the quirky, flawed, and totally lovable characters—from Becky’s family and friends to Reed’s siblings, parents, and niece who can’t stop talking about her bae, Harry Styles—fully embody what Meg Cabot does best. Messy-haired, Austen-quoting Reed Stewart is just the kind of charming, surprisingly honorable leading man to make any girl weak in the knees, and he *might* just be my favorite Cabot character to date. (Don’t worry, Cooper Cartwright. You’re still my bae.) The story is less about the will they or won’t they (although that’s there too), and more about the journey as it unfolds and the many obstacles—internal and external—that get in the way. Yes, I desperately cared about Reed and Becky finding a way back to each other, but I also cared about Reed’s relationship with his estranged father and Becky’s family business staying on track. I adored this book and everyone in it from top to bottom, and it proved what I’ve known for years: no one does rom com lit quite like Meg Cabot. The highest compliment I can pay an author is that from page one, I know I’m reading one of their books. Meg Cabot has a voice and characters that are uniquely her own, which have kept me devouring her books for over a decade, and will keep me clearing my schedule any time she has a new release for years to come. If you’re looking for a tasty, heartfelt and witty read to escape into, do yourself a favor and scoop up The Boy is Back. It’s a literary hole in one. If you read and loved The Boy is Back, be sure to pick up Meg Cabot’s other “Boy” books: The Boy Next Door, Boy Meets Girl, and Every Boy’s Got One. It’s not a linked series in the traditional sense, but all of these stand-alone novels share the same fun, modern-day epistolary format and they’re all completely addictive. For more on everything Meg Cabot, visit megcabot.com and be sure to follow her on Facebook and Twitter!